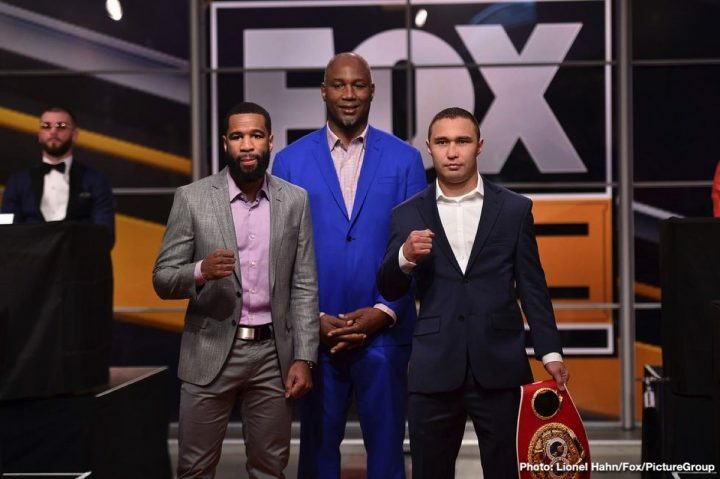 By Allan Fox: Former light welterweight champions Lamont Peterson and Sergey Lipinets, and long time 140 lb contender Anthony Peterson will be facing former IBF super featherweight champion Argenis Mendez this Sunday, March 24 on Premier Boxing Champions on FS1 from the MGM National Harbor, in Oxon Hill, Maryland. This is a crucial fight for the 34-year-old Lamont Peterson (35-4-1, 17 KOs), and former IBF light welterweight champion Lipinets (14-1, 10 KOs). Both fighters were recently beaten, and both cannot afford another loss for them to stay in the mix at 147. Peterson and Lipinets were at their best when they were fighting at 140, which is where they both held titles for a period. Now that the two have moved up to welterweight, they’re fighting in a weight class where they have no advantages over their opposition. The winner of the Peterson vs. Lipinets fight on Sunday will stay in the running for a title shot at 147. Former two division world champion Lamont ‘Havoc’ Peterson (35-4-1, 17 KOs) hasn’t fought 14 months since being stopped in the 7th round by International Boxing Federation welterweight champion Errol ‘The Truth’ Spence Jr. last year on January 20 at the Barclays Center in Brooklyn, New York. Peterson, who at one time held the WBA ‘regular’ welterweight title, has been inactive ever since that loss. With all the time out of the ring, it’s unclear whether Peterson still has the love for boxing. The loss to Spence obviously was a disappointing one for Peterson, especially with the way he was dominated the entire fight. But Peterson should have made his return to the ring a long time go instead of sitting inactive all this time. Being inactive for 14 months has resulted in Peterson being dropped from the top 15 rankings at welterweight. It shouldn’t be a problem for Peterson to get ranked quickly in the top 10 if he beats Lipinets on Sunday. Peterson will then be in the running for a world title shot against champions Spence, Shawn Porter, Manny Pacquiao and Keith Thurman. If Peterson had been fighting all this time, he would be an option for Thurman, Porter or Pacquiao for one of their voluntary defenses. Peterson is with Premier Boxing Champions, which makes him a great candidate to fight one of those champions. Lipinets lost his IBF light welterweight title last year in a 12 round unanimous decision defeat to Mikey Garcia in a competitive fight. The scores were wide in favor of the more popular Garcia, but the actual fight was close. Lipinets held his own in losing to Garcia. Lipinets lacked the boxing skills to do the job against Mikey in that fight. Lipinets has fought just once since that loss to Garcia, beating journeyman Eric Bone by a 10 round majority decision last August. The close call that Lipinets had beating Bone showed clearly that he really should have never been a world champion at light welterweight in the first place. Lipinets would have likely been destroyed by Terence Crawford if the two of them had faced each other last year. Crawford vacated his IBF 140 lb title and moved up to 147 after the International Boxing Federation ordered him to defend against him. Lipinets then defeated little known Akihiro Kondo (31-8-1 18 KOs) by a 12 round unanimous decision in November 2017 to capture the vacant IBF light welterweight title. If Lipinets had to face the hard hitting Ivan Baranchyk for the vacant IBF 140 lb belt, he likely would have lost to him badly. Baranchyk currently holds the IBF 140 lb title after beating Anthony Yigit by a seventh round stoppage last October to win the vacant IBF belt after Mikey Garcia vacated it. Like his brother Lamont Peterson, the 34-year-old light welterweight Anthony Peterson (37-1, 24, KOs) is coming off of a long 14 month layoff since his 10 round no contest against Luis Eduardo Florez last year in January. It’s unclear why Anthony and Lamont have been inactive for the same period of time. Whatever the case, Anthony Peterson needs to step up the level of his opponent. He’s been facing strictly mediocre opposition since losing to Brandon Rios by a seventh round disqualification in September 2010. That was a fight that Peterson was getting dominated in by Rios. Peterson was disqualified for throwing too many low blows. Some boxing fans think Peterson had himself disqualified on purpose in order not to avoid getting knocked out by Rios. Although Peterson hasn’t lost a fight since then, he’s not fought anyone talented in the last nine years of his career. It’s mind-boggling to try and understand why Peterson never stepped it up again after his loss to Rios. Since that defeat, Peterson has beaten these guys: Daniel Attah, Dominic Salcido, Edgar Riovalle, Marcos Jimenez, Ramesis Gil, Samuel Kotey Neequaye and Luis Eduardo Florez. In other word, Peterson hasn’t been fighting contenders. He’s also not been particularly busy with his career. Peterson fought once in 2016, not at all in 2017, and once in 2018. He’s now been out of the ring for over a year since his last fight in January 2018. With an activity level like that, it’s no wonder Peterson isn’t ranked in the top 15 at light welterweight. Peterson will be taking on 32-year-old former IBF super featherweight champion Argenis Mendez (25-5-1, 12 KOs) in a 10 round fight. Mendez held the IBF 130 lb title from 2013 to 2014, losing the belt to Rances Barthelemy in a 12 round unanimous decision defeat. Despite beating former lightweight world champion Miguel Vazquez in 2015, Mendez’s career has imploded with him losing to Robert Easter Jr. and Luke Campbell. On the bright side, Mendez has won his last two fights, beating Eddie Ramirez and Ivan Redkach. Mendez looked good in both fights. Mendez has to be seen as the favorite against Anthony Peterson. Mendez, who comes from the Dominica Republic, at least was a for a short period of time a world champion. Peterson never rose to that point in his boxing career. The loss to Brandon Rios seemed to take all the air out of Peterson’s tires, leaving him on the side of the road, doing nothing with his career. Mendez has got the power, experience, boxing skills and he’s the younger fighter of the two, which is hard to believe. Mendez has more mileage on him than Peterson, but only because Peterson has done nothing with his career since his loss to Rios.